‘Star is Born,’ ‘Overlord,’ More on Home Entertainment … Plus a Giveaway!!! 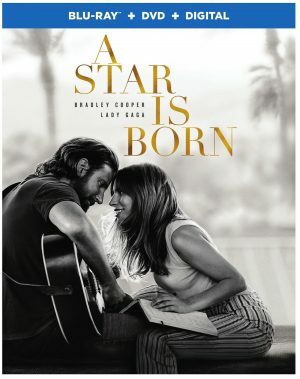 The critically acclaimed and Oscar-nominated drama “A Star is Born” will be released Tuesday Feb. 19 on 4K Ultra HD Combo Pack, the Blu-ray Combo Pack, the DVD Special Edition and Digital, from Warner Bros. Home Entertainment. Four-time Oscar nominee Bradley Cooper (“American Sniper,” “Silver Linings Playbook”) makes his directorial debut, and also stars alongside multiple award-winning, Oscar-nominated music superstar Lady Gaga in her first leading role in a major motion picture. Cooper portrays seasoned musician Jackson Maine, who discovers and falls in love with a struggling artist. Ally has given up on her dream to become a successful singer until she meets Jack, who immediately sees her natural talent. The film also stars Andrew Dice Clay, with Dave Chappelle and Sam Elliott. In addition to playing Ally, Gaga performs original songs in the film with Cooper, which they wrote with a handful of artists, including Lukas Nelson, Jason Isbell and Mark Ronson. The music is original and all vocals for the movie were recorded live during filming. The 4K Ultra HD Blu-ray disc of “A Star Is Born” features Dolby Vision HDR. The 4K Ultra HD Blu-ray disc of “A Star Is Born” will also feature a Dolby Atmos soundtrack remixed specifically for the home theater environment to place and move audio anywhere in the room, including overhead. “A Star Is Born” also will be available on Movies Anywhere. Fans already can also own “A Star Is Born” via purchase from digital retailers. Produced by J.J. Abrams and directed by Julius Avery (“Son of a Gun”), “Overlord” lands on 4K Ultra HD, Blu-ray, and DVD Tuesday Feb. 19, from Paramount Home Media Distribution. It also is available now on Digital formats. “Overlord” tells the story of a team of American paratroopers who come face-to-face with Nazi super-soldiers unlike the world has ever seen. It stars Jovan Adepo, Wyatt Russell, Pilou Asbaek, John Magaro, Bokeem Woodbine and Mathilde Ollivier. Embraced by critics, “Overlord” is the wildly entertaining genre mash-up boasts a stellar ensemble cast, non-stop action and plenty of wild twists you have to see to believe. Fans can go even further behind enemy lines with nearly an hour of explosive bonus material on 4K Ultra HD Combo Pack, Blu-ray Combo Pack or Digital. The 4K Ultra HD disc and 4K Ultra HD Digital release feature Dolby Vision HDR. The film also boasts Dolby Atmos audio mixed specifically for the home to place and move audio anywhere in the room. In addition, both the 4K Ultra HD and Blu-ray Combo Packs include access to a Digital copy of the film. “The Last Race” arrives on DVD and Digital HD Tuesday Feb. 19, from Magnolia Home Entertainment. The documentary film is an intimate portrait of a small-town stock car racetrack and the tribe of passionate blue-collar drivers that call it home, struggling to hold onto an American racing tradition as real estate development threatens its survival. First time feature film director Michael Dweck’s stirring imagery takes viewers inside the world of grassroots racing and eye to eye with the cars’ snarling grills and white roll bars that protrude like bones out of scarred metal. Yet the camera reveals the drivers as everyday people and learn that the racetrack is tied to a deep sense of identity. The track is on the only piece of undeveloped land in the area worth millions, and the only thing keeping the bulldozers at bay is track owners Barbara and Jim Cromarty’s love of the track and its community. “The Last Race” is available for a suggested retail price (SRP) of $26.98, and includes additional interviews, scenes and footage, along with the documentary. The lone surviving thief of a violent armored-car robbery is sprung from a high-security facility and administered an experimental drug in the action-thriller “Backtrace,” arriving on Blu-ray (plus Digital), DVD, and Digital Tuesday Feb. 19 from Lionsgate. This film is currently available On Demand. Starring Ryan Guzman, three-time Oscar nominee Sylvester Stallone (“Rocky,” “Creed”) 2015), and Matthew Modine (“Full Metal Jacket,” “What the Deaf Man Heard”), the Backtrace Blu-ray and DVD includes the featurette “Making Backtrace” and cast/crew interviews, and will be available for $22.99 (SRP) and $19.98 (SRP), respectively. Front Row Features wants you to see the critically acclaimed action-packed thriller “Overlord” in beautiful 4K resolution. That’s why we’re giving away a copy of the “Overlord” 4K Ultra HD/Blu-ray Combo Pack to two lucky readers next week. To enter the contest, simply email socalmovieeditor@aol.com by Feb. 25 for your chance to win. Good luck! Next PostPhotos: ‘Star is Born,’ ‘Overlord,’ More on Home Entertainment … Plus a Giveaway!! !